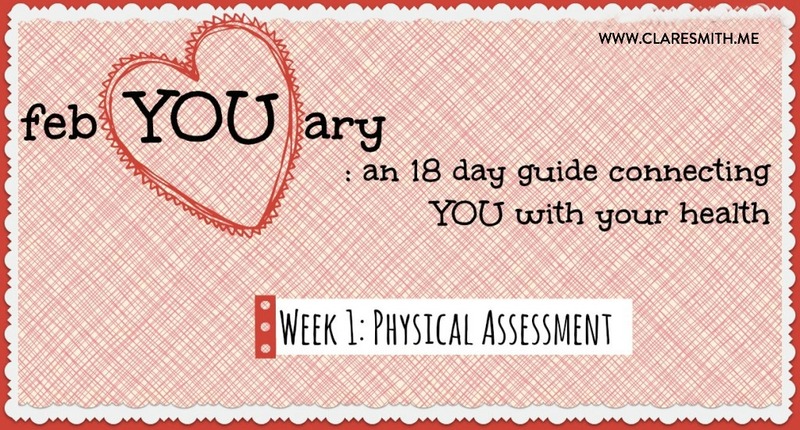 So here we are at week 1 of “febYOUary: an 18 day guide connecting YOU to your health“. This week will be the most tedious of the weeks that we will be progressing through as it will take day to day attention. Remember, I’m only asking that you do this for 7 days, but if you can commit and do it for the full 18 days, that’s even better! Here we go! You will have many different points of views about food/habit journaling. While many studies show that those who food journal lose more weight, more consistently, many other experts say that it’s not necessary to count daily calories to lose fat/weight. I am not a regular calorie counter or journaler. In fact, the last time I counted them was 13 years ago in a nutrition class in college! I have no idea how many calories I consume, or what my exact carbs/proteins/fat split is (otherwise known as “macro ratio”) HOWEVER–for the first time in 13 years, I want to know what I’m doing. I’m not trying to lose weight, so the journaling isn’t for calories per se, but instead what my macro ratios end up being. If you have no idea how much you are consuming (and most people don’t–OR they used to and assume they are still at that same level when in reality they’ve probably increased) then it’s not a bad idea to do it here and there through the year just to take stock of what’s going on. You may find a few hundred calories (and type of calories) that are hanging you up with those final 5 pounds. And journaling is one great way to identify that! I am super curious to see what my numbers end up being!! However, if you are happy with your progress, pretty aware of the food you are intaking, understand portion size, and getting the nutrients and energy you need, then no need to fret with journaling. WHY journal more than food? You can see that I’m mentioning more than just food intake. Our health is made up more than just the calories we take in and out, and how we move. We have other factors such as stress, sleep, hormones, and cravings that do play a huge part into the equation. You rarely hear any fitness professionals dive into this part of the equation which is a shame, because I feel like it’s not taking a look at the whole puzzle. If you have been following me for any amount of time, you know that I’m a huge fan of The Metabolic Effect. I found their site over a year ago and have enjoyed every bit of info they put out. I got their book and remembered thinking that someone finally put into words (and scientific study) what I had been thinking for years! (except they are much smarter than me! Ha!) They are big proponents of this other side of wellness and I will be referencing their material when I can. I recommend that you follow them on facebook and/or twitter, and pick up their book just to see if anything clicks with you. With all this said, I’ve created an additional tracking method that I want you to use on top of your food journaling method. Print one of these off each week and fill it out every day. I’ve included one as an example below. You may not be able to articulate your thoughts clearly on some of the days, and that’s ok. Do your best. This is new and any little bit of info that we can find out about yourself will be helpful. There is a section in the new printable where I ask you about cravings. I understand that it can get really confusing in regards to something being a craving (or as they list it below, emotional hunger) or actually real hunger. I found this on Metabolic Effect’s facebook page the other day and I think it does a great job of taking you through how to decipher! Another way to look at it is: hunger is felt in the gut, cravings are felt in the head. (Metabolic Effect) Here is a great article that goes into that in much more detail. 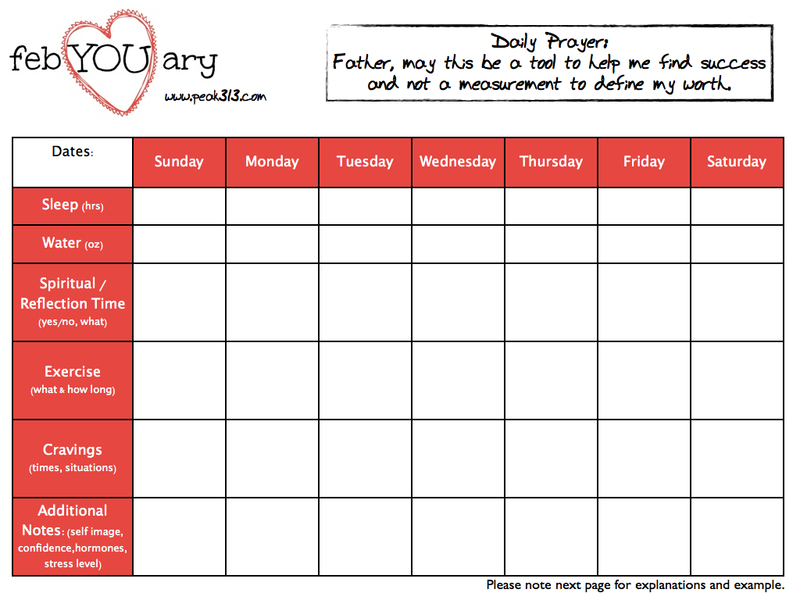 I have added a sentence prayer to the top of the printable that I want you to pray (at least) once a day. Why do I do this? Because I know the nature of the beast. I know what it’s like to be consumed with the physical body and forget that we have “another” life to live. I know that satan will do his best to draw us away from the things that matter most, cause doubt in our heads, and make us live up to unhealthy comparisons. So please, make sure you are taking every day to the throne of God. We should be doing this anyway, but I want us to really focus on it the next 18 days. So here’s what you need to do starting NOW! 1.) Figure out which journaling plan you will use. I will use myfitnesspal. some may prefer another software, while others will go old school and write it down! Remember–we cannot fix what we do not know. And I’m convinced that many of us are walking around not really knowing what’s going on in our physical (and emotional/spiritual) make-up of our health. Once we find some key facts, and then can find specific solutions to them, we can be well on our way to a successful journey! Your best bet is to IMMEDIATELY write/note what you ate/drank/felt. If you wait until a few hours, you will probably forget or misjudge your portions! I know it’s going to be a pain, but it’s also a pain being unhappy with how your health state is. 🙂 So choose which one you’d rather deal with! REMEMBER: We are not trying to CHANGE our current habits these next 18 days. We are just trying to evaluate them. Try to keep to as “normal” of a food/exercise/schedule that you do. After the challenge, we’ll discuss what to do next! If you are in, comment below with what program you will be using to food journal! Feel free to post on my facebook wall, tweet, instagram, or email me with any thoughts or questions you have! Im in! I will use myfitnesspal as well. Count me in using MyFitnrssPal! I have been using sparkpeople.com for food and exercise journaling for a couple years. Free and super helpful. I use Lose It (but not every single day so I hope this helps me get back on track with my journaling) Thanks for doing this! I will be using my fitness pal. I’m going to use Sparkpeople.com and this great printable. Thanks for the challenge and encouragement. Using “LoseIt”…I’m on all 3 (myfitnesspal, sparkpeople and loseit) but always switch back and forth to keep things interesting. I use sparkpeople to give me an idea of what I might eat that day and then track on LoseIt and sometimes I do paper tracking as well. Thanks for the printable! I’m in! I’ll be using pen and paper. I’m in as well, will be using paper and pen! I will be using the printable. Hi Lisa. You will also need to use some type of food journaling app or just write it down. 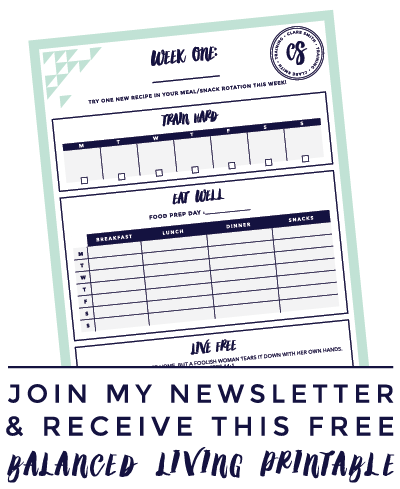 The printable is in addition to food journaling! I use Supertracker to track my calories. I’m going old school, I love my purple pen lol. Thanks for the printable! I’m in! I will use myfitnesspal too! I’m so excited to begin this! I am SO in for this! Can’t wait! I’ve been using MyFitnessPal for about a year and will continue with that for the challenge. Can’t wait to see how the Lord is going to use this in my life. What a blessing, Clare! Nutrimirror for my food log. I’m installing MyFitnessPal as I type this. Can’t wait to unlock some secrets I’ve been keeping from myself during this study! I’m in! I’m using a combo of my fitness pal and old school paper and pen. Looking forward to becoming aware of my habits! I’ll be using the myfitnesspal app. I love it, it is easy to use and has a HUGE database! Going old school! I’ve tried myfitnesspal before but didn’t keep with it. Maybe I’ll try it again(too). I have at times noticed that my hunger isn’t real(emotional) but not always. Hoping to be more aware of my cravings, which I have a lot of. It doesn’t help that I’m a foodie and LOVE food! I’m in and going old school. I’ll be using fitbit and sparkpeople. I will be using myfitnesspal. I’m using my fitness pal. I’m 20 wks pregnant so I feel like there is no “normal” for me right now. But I’m sure I’ll still learn a lot! I’m using Fitness Pal to track my food intake. I’ve printed out your tracker and I’m excited to begin! Thank you, Clare! I will be using Nutrimirror. I’m using Myfitnesspal and your printable. I really think you are on to something with the notes sections–I feel just horrible today- moody, emotional, and feel like I’m such a failure. I’m not hungry at all, and couldn’t even eat breakfast, but I did have a protein shake so I don’t get ‘shaky.’ My period just ended and when I did my weekly weigh in and measurements, there was not much difference at all. I am really hoping this is part of the the ‘hormonal’ issues working themselves out as I get into more metabolic burning, but today is just horrible. Thank you so much for this post–at least it gives me something to focus on instead of feeling so bad. I just pray for the Lord to lift me out of this–because I know that I can’t do it myself. I’ll be using myfitnesspal (as soon as I remember my password! (: ) and pen and paper. Along with the printable! I’m in myfitnesspal and the printable ! thanks! I’m in! Better late, than never! 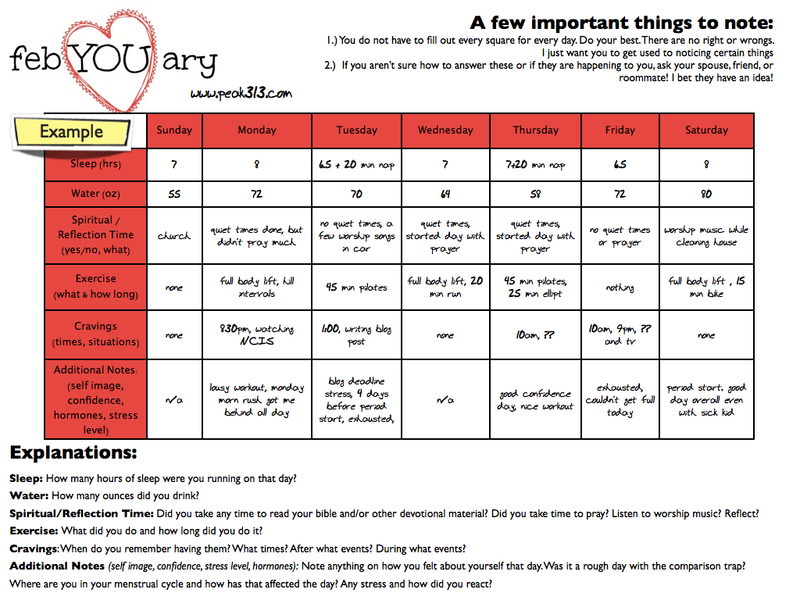 I am using myfitnesspal & the printable for things that aren’t on fitnesspal! I am joining late. I’ll be using Sparkpeople.com for my Food Journal. SparkPeople.com. Wish I had a Fitbit but don’t have one yet. Although late, I’m in! Looking forward to doing all my homework. Anyone here from Atlanta/Roswell Ga? It’s the best place to log food & fitness & journal for FREE! Find me there at “Jillsworld” – stop in and say hello. If new to SparkPeople use me as referral – we get spark points for getting folks to begin their journey!! I started using fitness pal and I really like it. I hope I’m not to late. I would like to do this also. Hey Shannon! That is great you will be doing this but I just want to remind you that this will not be done live but instead on your own!